Good news. 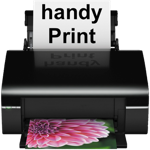 We have a pretty stable beta version of handyPrint that is compatible with OSX 10.9 (Mavericks). In the process of re-writing the application we decided to move away from a Preference Pane to a more traditional application that you would typically find in the Apple app store. This does not mean that we will offer the app via the App Store but rather that it will feel more at home with what users are expecting from an App Store application. 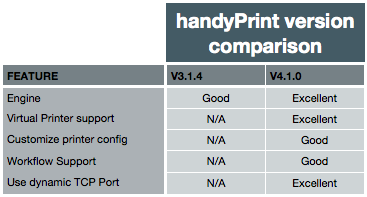 handyPrint version 5 does not add any new features. We had to do significant work to port from a PrefPane to an application and we are focussing on polishing this at the moment. With version 5 we will also increase the minimum donation amount to be fair to the average. In the past we have asked for a minimum of 1$ but have found that the average donation is actually between 5$ and 10$ with some donating upward of 100$ (thank you guys and galls). We are spending a fair bit of our free time supporting the application and have therefore decided to increase the minimum donation to 5$. Any one who donated 5$ or more will be entitled to a free upgrade to v5.0. For the users that donated between 1 and 4.99 we will provide you with the details of what was the donation and will allow you to donate the difference to bring the total to 5$. We hope you will understand. Again, many thanks to our thousands of users out there. I am happy to report the publication of the production release of handyPrint. 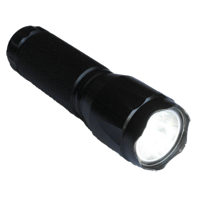 The latest version is v4.1.0 and has been stable for the last few beta releases. If you want to get the release version just head over to the application page.